No limitations to what encapsuling SiTek can do ! Not even the best sensor can function without a package. At SiTek we can offer a package optimised for every need. After 25 years in business we have a great deal of experience in chip packaging. In our standard designs there is a good selection of packages for different chip sizes and different needs but it doesn't stop there! Ceramic package. They are available in a number of different sizes and shapes and are a cost effective package for smaller size chips. Choose between circular, square or rectangular packages, whatever fits your product best. Our standard substrate packaging is a cost effective package for all chip sizes. It is available with or without a filter/glass and is an attractive package for almost every application. SMD-packages. These are available on request in several sizes and materials. This is the optimum package for effective assembling at your end. Custom design. If you have special demands about the design and function of the package you should choose a custom designed substrate. Alternatively we are happy to help you integrate our sensor into your design to reach a more effective production process. We can also customise substrates to accommodate other components. Kovar packages. Sometimes a stable metallic package is necessary. The metal that is most compatible with silicon and ceramic in terms of heat elongation is kovar. If your product is designed for a special package, we can of course mount our chip into any of your favourite packages. Standard glass or custom filter! We supply our sensors with or without glass or filters depending on your requirements. 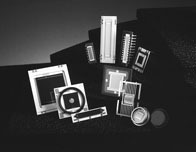 We can for instance supply our sensor with glass and filters with various AR-coatings. Temperature control! Do you want to regulate the temperature of your sensor? We can do this by mounting a peltier element, heat sink and a fan depending on your application. Or do you want to fit the package into your own mechanic? Tell us about your specific requests, when it comes to packages, filters, mechanics or design, there are no limitations to what SiTek can do.